Spring was in the air. The red tulips were nodding in the gentle breeze. The daffodils were standing at attention like tin soldiers with trumpets and the hyacinths danced like merry ballerinas as the soft wind swirled around them. Though spring can be a tricky time weather-wise on Barra, today promised to be a lovely day. The butterflies were busy fluttering from flower to flower, sipping the sweet nectar from the delicate centers, nestled between the soft petals. Bees could be heard buzzing past, rushing to gather mud to build their new nests. "Lads, would you like to go for a walk down on the beach?" Tom Maxwell called to his dogs, Cockles and Mussels. Cockles opened his eyes. "Did he just say walk?" he muttered to Mussels, who was lying next to him. Mussels yawned. "Walk?" He jumped up and ran towards Tom. "I suppose that means yes," Cockles said, standing up. 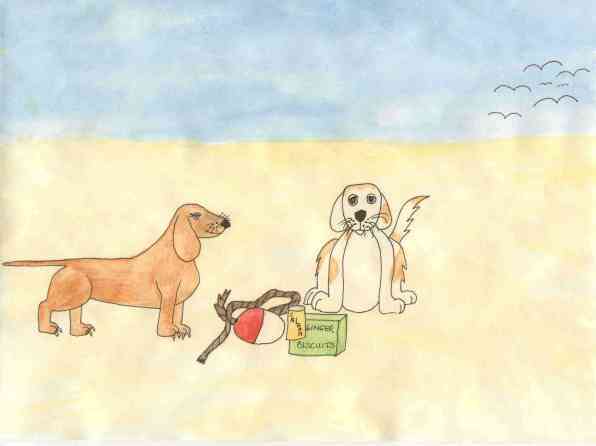 Being a dachshund, he couldn’t run as fast as Mussels, but soon caught up with the two of them. "You want to go for a walk after all," Tom laughed. "You two looked like you were enjoying your nap in the sun. It must feel wonderful to lie on the grass." Mussels barked and Cockles wagged his tail. "Let’s be on our way then, lads," Tom said and headed for the beach. Cockles and Mussels ran ahead of Tom. "Look at all the flotsam," Mussels said. "The beach is covered with it." "And with seagulls," Cockles added. "Feel like having some fun?" Mussels grinned a devilish grin. "Aye, I’m with you on this one," he said. The two dogs ran towards a pile of seagulls that were gathered around a pile of washed up cork. "BARK! BARK! BARK!" The seagulls flew into the air, squawking and landed further up the beach. Cockles and Mussels investigated the cork. "Where’s this from?" Cockles asked, nudging the bits of cork with his snout. "Looks like it’s from Italy. How did it end up here, on an island off the western coast of Scotland?" "The tides are strange. Did you see those seagulls fly away? Hee hee. We showed them whose boss, didn’t we?" Mussels laughed. "We did at that. I see another group of them up there. I wonder what they’ve found. I suppose we’ll have to go and check it out," Cockles said. "Ready?" "Ready," Mussels answered and the two dogs ran towards the seagulls. "BARK! BARK! BARK!" The seagulls flew into the air and circled around the dogs, squawking angrily. Tom, who was sitting on a tuft of sea grass called out, "You’d better watch yourself, lads. There are more of them than there are of you." Mussels heard and ignored him. Cockles said, "But we’re bigger, hee hee." "What have we got here?" he wondered, sniffing the pile of rubbish. Mussels grabbed a piece of rope with his teeth and pulled it out of the way. "Aha, we’ve got a float here," Cockles said, tugging it out of the way. It was red and white and made of plastic and very light. "There’s a can of some kind of food. I’ll bet those seagulls would like to have a can opener," Mussels laughed. "It’s salmon. I don’t like salmon. Do you?" Cockles asked. "No. Let the birds have it," Mussels said. He carried the can out of the way, dropping it near the rope. "What else is there?" "Not much. An empty beer bottle and no, there’s no note inside, hee hee, and a piece of driftwood. I wonder if Tom would like it for the house. I’ll run it up to him," Cockles said. He grabbed the driftwood and ran over to Tom. "I see you lads are having fun with the birds. Remember, Cockles, seagulls are hungry creatures who won’t stand you being around for too long." He petted Cockles behind the ear. "Go on then. Go and find Mussels. Looks like he’s having fun chasing the birds." Cockles looked over to where Mussels was. He was running around the beach, chasing the seagulls. Whenever one landed, he ran towards it barking loudly. Cockles ran off to join him. They had a great time chasing seagulls. "Och, what’s this?" Mussels said, stopping at another pile. "It looks like a package of ginger biscuits. It’s wrapped up in plastic and there’s no water in it. Let’s have a go at it, should we?" Cockles tugged at the plastic while Mussels held the box in his hand. Soon the plastic wrap was off and the dogs were tearing into the cardboard box. "It is ginger biscuits. Yummy," Cockles said. He took a bite of one. "Delicious." The seagulls, which had been watching, smelled the biscuits. Suddenly they gathered together in a large group, began to squawk loudly, and flew right for the two dogs. They began to dive at them, trying to peck them with their beaks. "Och no, the birds," Mussels said. There were too many of them. Cockles and Mussels had no choice but to leave. They’d gone a few feet when Mussels said, "We can’t let them have our biscuits." He ran back towards them. "BARK! BARK! BARK!" Cockles followed. "BARK! BARK! BARK!" The seagulls flew into the air but instead of flying away, came after the dogs mercilessly. They pecked them and scratched them with their talons. "Ouch," cried Mussels. "Let’s get out of here. There are too many of them." The dogs began to run down the beach, chased by the seagulls. Tom was watching and laughing hard. "Come on, lads. Come to Tom," he shouted. The dogs headed right for him and jumped up on his lap for protection. "Safe at last. I warned you, lads." He headed towards home with Cockles and Mussels right on his heels. When they reached the house they ran back to the patch of grass next to the flowers and lay down. "I’d much rather lie here than chase birds," sighed Mussels. "Me too," yawned Cockles and soon both dogs were asleep.